I have partnered with Mediterranean Delicacies to bring you a recipe for fish cakes using their amazing range of fish I found at my local supermarket. The theme for my recipe is #AfroChic and it is the reason I chose to use Peppadews® as this piquante pepper is a uniquely South African product. If you open my fridge at any time, you will always find a small selection of meze to add to our weekend table at lunch time. This is the one meal I really do not like to spend time on and so I choose to go for convenience rather than effort. I make sourdough bread each weekend to accompany our spreads and dips. Dave spends as much time as possible working on the house and I am in the kitchen creating recipes for the blog. I tend to dish up dolmades, which I heat for a minute in the microwave. A tip given to me by my sister who learnt it from her Bulgarian husband. Another favourite of mine is taramosalata. I can spread this on anything and I love the taste. I also try and keep a tupperware of hummus as this can be used as a spread or a dip for vegetables. Now, I always make my own hummus but I have yet to attempt making stuffed vine leaves or the taramosalata. For these two I turn to Mediterranean Delicacies as they have the recipe down pat. They are exactly my idea of an easy lunch time spread. 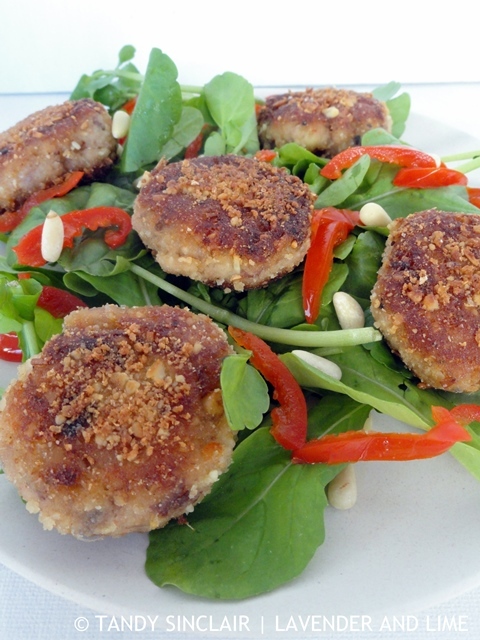 I made 12 fish cakes from my ingredients and served them as a starter without any additional dressing or seasoning. Disclosure: I have been paid for the creation of this recipe. This post is in line with my blogging policy. ooo fish cakes. That sounds good. This is salad perfection. Love the fried cakes! 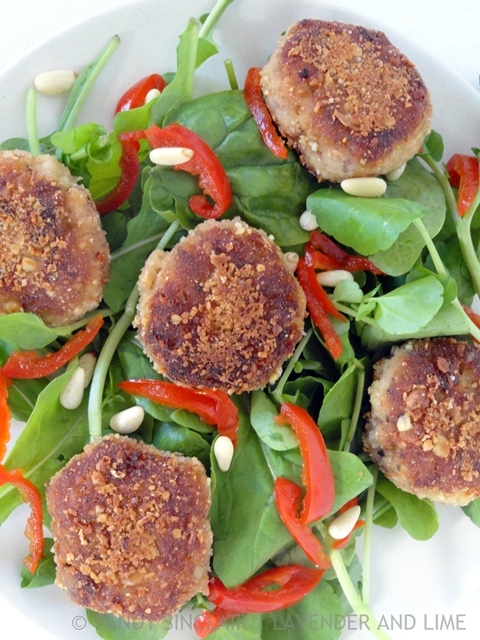 Lovely fish cakes I want to try peppadew pepper now and pine nuts are a great addition. These look so yummy. I really love meze, too. And especially taramasalata. This looks so good. I’m hungry looking at it. Mmmm! These sound delicious! I love a good fish cake. I’ve never made fish cakes before, they look delicious! Hi Tandy,your week-end meals and snacks sounds amazing and very healthy too. Love the fish cakes and presentation. I love fish cakes! I make mine with coriander leaves. Delicious, I love fishcakes! This reminds me that I must make them again sometime. This looks absolutely delicious. I haven’t had a fish cake in so long. Great post. Yes, I love to have hommus on hand as well. So convenient and versatile. You’re right you know, sometimes it’s not worth making something if someone is doing it so right. And you time is money too so why not leave it to the professionals? Love your fish cakes. They look delish. A perfect lunch. That creamy peppadew pepper dip sounds amazing – I bet it adds so much flavor! Yumbo. I haven’t made fish cakes in forever, I tend to go to the asian flavours with my cakes, but look forward to trying the Mediterranean flavours now too. 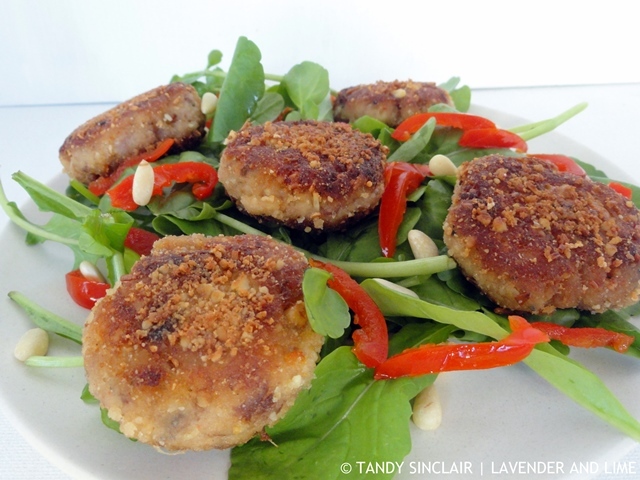 My daughetr loves fish cakes, and I am sure she will enjoy these. Thanks for the recipe, Tandy.